My poor master bath desperately needs a makeover. I’ve been trying to decide what to do with it since we moved here, so I’m always on the look-out for master-bath inspiration. When Hooked on Houses reader Heidi sent me photos of her bathroom remodel, I was definitely inspired. Hers was small, dark, and outdated, as you can see in the “before” pics. 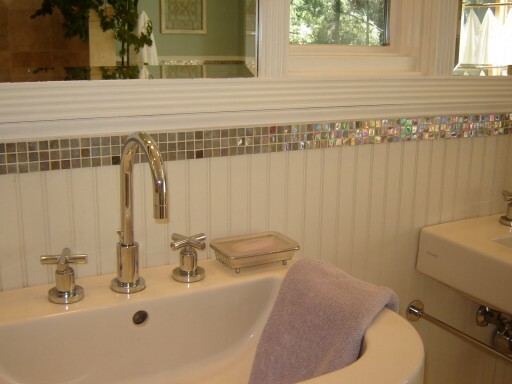 To trim the beadboard wainscoting, Heidi chose these iridescent mosaic tiles (Bizazza tile, from Italy) because they reminded her of sea glass, “which is one of my favorite things in the world.” The lovely wall color, Martha Stewart’s “Atlantic,” was chosen to complement the tiles. She also chose more contemporary-looking faucets than you might expect in a traditional-looking bath because she wanted to “mix it up a little.” She says she prefers an eclectic look over having everything match. The new limestone floor is heated. Heidi says the shower ended up big enough to fit their entire family, plus pets, friends, and neighbors! I think they did a beautiful job creating a spa-like bath for themselves. Thanks to Heidi for sharing it with us! You can see the rest of the photos and get more details about the remodel on her blog, Heart and Home. Which Room in Your House Needs a New Look? Lovely! I love the colors – all my favorites! .-= Celeste @ Cottage Dreamers´s last blog ..Fireplace =-. 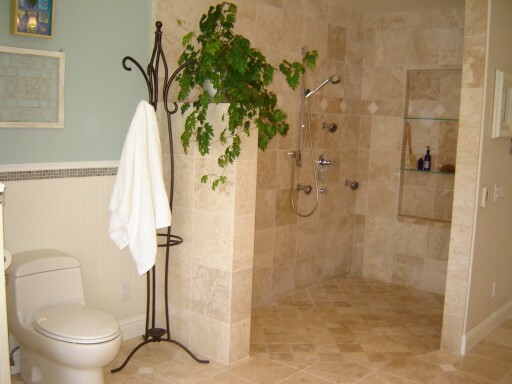 WOW….it’s all beautiful, but the Biazza tile is gorgeous. What a transformation. .-= Billie´s last blog ..I dream of spring… =-. Wow, what a transformation. I love the tile they used for the shower. .-= susie´s last blog ..~ MY FIRST GIVEAWAY ~ =-. .-= Janet´s last blog ..Happy Birthday Mom! =-. Oh my gosh that is absolutely stunning! What a dream-come-true bathroom! I love everything about it – especially the sea-glassy tile and the tub. Swoon! .-= christy´s last blog ..The witching hour =-. Oh, my. Now that is a beautiful space. I’m not sure I’d ever want to leave it in the morning! .-= Richella at Imparting Grace´s last blog ..Hurry! Hurry! =-. .-= Marija´s last blog ..Just do it =-. .-= Janell Beals´s last blog ..Revisiting The Painting Of The Kitchen & Family Room Cabinetry =-. Wow! Beautiful! Love all the details. .-= Emily@remodelingthislife´s last blog ..Running Up Debt =-. I would never want to leave it! WOWZA! I just love before and afters. They did an amazing job. Love the little sparkling backsplash and the curtain by the tub. .-= Becky @ Farmgirl Paints´s last blog ..More cupcakes please:) =-. I’m so honored to be featured on Hooked on Houses, wow this is exciting. Thanks so much for showing the pictures of my bathroom! I do love that space! .-= Heidi – Heart and Home´s last blog ..All Covered Up at Heart and Home =-. .-= Brenda´s last blog ..Walkway Re-do =-. .-= the BLAH BLAH BLAHger´s last blog ..Don’t Wait for Something Special =-. LOVE the tile/beadboard mix. It’s a much more light, open, and inviting space! .-= kitliz @ DIYdiva´s last blog ..Houseblogs: Weekly Wrap-up =-. i think the tile at the top of the beadboard is an unusual and delightful touch! .-= anna see´s last blog ..She’s Baaaaack! =-. Thanks for a great post and blog! .-= Struggler´s last blog ..Art Chaos: a great problem to have =-. I absolutely love it!!! They did an amazing job. Thanks for sharing. .-= Shannon´s last blog ..Be Dazzled =-. .-= Vicki´s last blog ..Sandbox Lessons – Defining Success =-. Wow! Amazing transformation. To have a bathroom like that is on my “Someday” dreams list. Beautiful, so many lovely details! .-= Hip Hip Gin Gin´s last blog ..‘Tis the season to take down that holiday wreath =-. Would love those tiles in our kitchen as a backsplash. Beautiful, luxurious remodel…thanks for posting it. That is SO gorgeous! I love before and afters. What an amazing transformation! What a nice , lovely bathroom. Love the glass tile too..
.-= mishelle´s last blog ..Help. Should i paint the kitchen green too! =-. 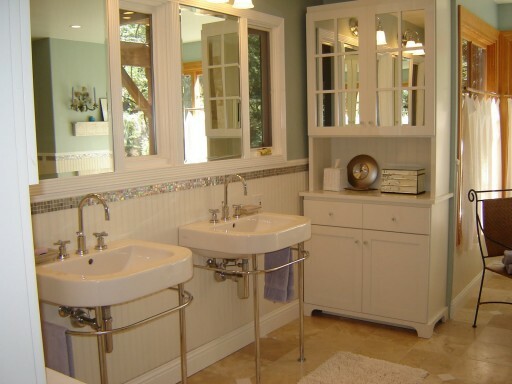 Wow – Love the two sinks with the chrome bars and the tile. Gorgeous! .-= Marsha´s last blog ..Beach House Chandeliers & Stuff =-. If I extended my bathroom into the next room or two or three…I wouldn’t have any bedrooms, how fortunate to have the option! Thank you so much for sharing this. I love your blog and I love coming here for inspiration. We have three baths that need a redo. Funny how these things sneak up on you. We won’t be able to do all three this year so our master will probably have to wait until next year but I am already starting to collect ideas for where we are going. There were several here that I will add to my file. .-= pam @ becolorful´s last blog ..Pillow of the Week #6 = Pink Floral Happiness =-. well I’ve never seen mirrored mosaic b4, I’m def in love with that – will probably do similar in next home – thanks babe! .-= Annie@A View on Design´s last blog ..Toorak’s finest =-. What a gorgeous space! I love that tile. Absolutely beautiful! A great master bath is something I dream of having someday. .-= Sarah´s last blog ..kiss and tell =-. Long time reader . I just finished watching the movie Ladies in Lavender. Liked the interior of the cottage& the wonderful garden outside.I immedietly thought of your site. Dont know if u are looking for suggestions from readers. but I thought I would mention the movie name, anyway.Do check it out if u are interested. .-= Why S?´s last blog ..Colonialism in the Modern Age (or The Age of the Moderns) =-. .-= Cyndi´s last blog ..A New Look =-. .-= le @whoop whoop´s last blog ..Linked Inspiration Five – Urban Chic and Art =-. 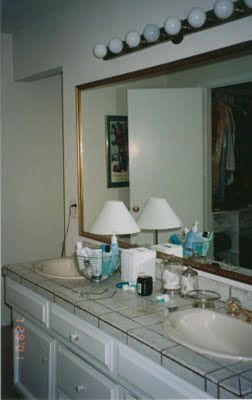 Wow, what a beautiful bathroom remodel, they did a wonderful job! I love the tiles she chose, I love sea glass too! 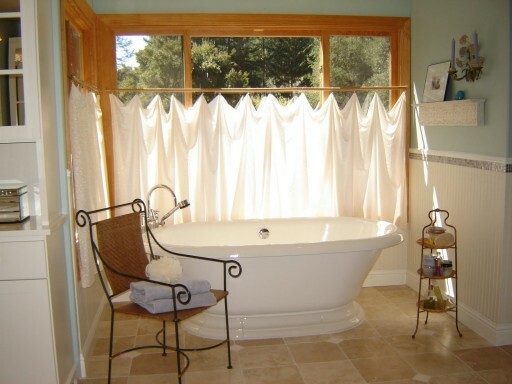 And that tub, right next to the windows…I could hang out there for hours! .-= low tide high style´s last blog ..Chalk is Cheap =-. Oh wow is all I can say! What’s not to love?? The iridescent tile is the icing on the cake, but I love that tub in the bay window too. .-= Susan´s last blog ..How Lucky Can You Get? =-. such a beautiful bathroom, thanks for sharing the pictures! I really love those faucets. Our bathrooms really need a little updating so I am bookmarking this page! .-= Anna´s last blog ..New (old) chairs =-. Beautiful bathroom. I love the tile border and curtains. Thanks for sharing. .-= Allison´s last blog ..Antique-Print Picture Wall =-. .-= m´s last blog ..Egg-quisite & Give Away Day Details… =-. What a beautiful transformation!!! So inspiring! Love ALL the details! What an amazing transformation! The tiles as trim to the wainscoting was a genius style choice, and really brings something unexpected and just … pretty … to the bathroom even though a man shares the space as well. We are talking and talking about the faucet and fixtures to use in our bathroom once we get going. 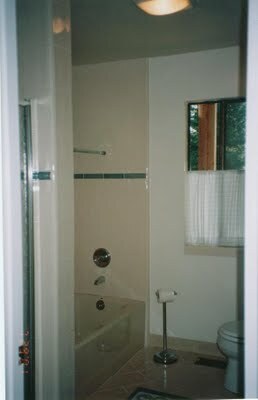 .-= Heather´s last blog ..How To Create The Perfect Shower =-. What a gorgeous makeover this is. I love the mosaic tiles, the floor tiles and the bath. Such a beautiful bathtub. .-= Treasia´s last blog ..Rednesday & A Giveaway =-.